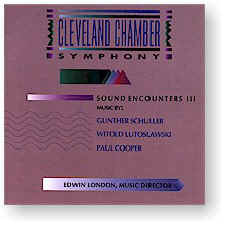 Edwin London leads the Cleveland Chamber Symphony as they press forward with Volume III of the groundbreaking Sound Encounters series that begin with its highly acclaimed 1993 GM debut. Since 1980, the Cleveland Chamber Symphony has repeatedly proven itself to be among the world’s most accomplished ensembles performing ‘new music.’ Few others institutions have contributed so much to advancing the art of primarily American contemporary music by commissioning, performing, recording and promoting major works by composers of our time. Since its founding, the orchestra has presented world premieres of more than ninety works to wide international acclaim. The Symphony’s excellence has been repeatedly recognized with numerous prestigious awards, including ASCAP’s Edwards Award for the strongest commitment to American music as well as grants from the NEA, the Bascom Little Foundation, the Aaron Copland Fund for Music and many others. Click here to get all three volumes for only $25.00! Recorded at Cleveland State University in Cleveland, Ohio.